The next Wiggins and Cavendish?! We took the boys out to the Avalon bike park in Lower Hutt the other weekend. And then didn't see them for the next half an hour. It's such a cool place - complete with roundabouts, Give Ways, and judder bars (translation for you non-Kiwis: speed bumps) and even a train (read: miniature train that comes around every so often but watches out for the kids!) crossing for them to practice their road etiquette. We sat and watched and enjoyed seeing little legs flying. Hard to believe that the littlest legs kept up with the bigger legs - they were fair flying at twice the rate, it's little wonder he got tired more quicker! One boy mad on Harry Potter. The other who just loves to do what his big brother does. Getting their 'serious' on just like their hero in this shot. I swear there are more cruise ships visiting us every summer, sometimes up to 4 or 5 a week. I snapped this picture of one cruise ship as it came in early morning with the sun heralding its arrival. Magic. Cleaning bathrooms is not my favourite past-time. But even less appealing is having all that hair in my face while I'm doing it. This is where I invented the 'I mean business with you bathroom' topknot. And I'm sure I managed to clean the bathrooms faster than normal. After seeing a pin on Pinterest, I thought I'd treat the boys to a naughty version of a popsicle. Made with lemonade and with soft jelly lollies in them - they went down a rip roaring treat! Loved this Air NZ safety video with hubby's favourite hero Bear Grylls. 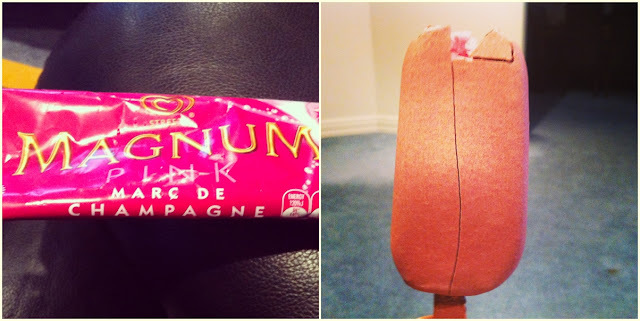 Loving this new Magnum icecream. The pearly glittery outside shell leaves a lovely sheen on your lips and fingers and the subtle champagney taste. Have you tried one?! I can't believe Easter is only a week away - far out how fast did that come around this year?! Just when I thought they were doing a flight video without that flight attendant who seems to be in all the latest airnz flight video, out he pops out of the moa! Love your serious topknot - go get that soap scum, Meghan!! Eeek bathrooms are on my agenda this week too...I may need to make some of those popsicles to make up for the grumpiness this week. LOL I wear my hair like that when I'm cleaning too! I've been reading your blog for a while and thought I should actually comment for once (maybe you noticed a random Norfolk Islander dropping by). I love the Air ZN safety videos - there have been quite a few hilarious ones!!! I might need to try that chamapagne ice cream!